April fool’s day 2015 saw us bowling over Sir Lowry’s Pass in bright sunshine bound for Victoria Bay, perhaps a few hours behind schedule, but at least leaving as planned months earlier, on the right day! We were ecstatic to be escaping the maelstrom of civilisation. Well, more or less escaping, if driving into the south and east coast Easter holiday rush could ever amount to that. 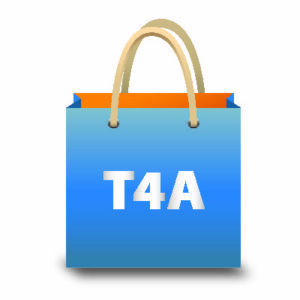 The first few weeks of April we knew were bound to be busy and so we had booked ahead as we headed towards Mozambique. Victoria Bay confirmed our expectation as a quaint and charming spot, whose delights we couldn’t fully appreciate because of remaining admin that consumed our free day there. At least we did manage a brisk run along the track of the old Tjoo-Tjoo steam train, which was very special. 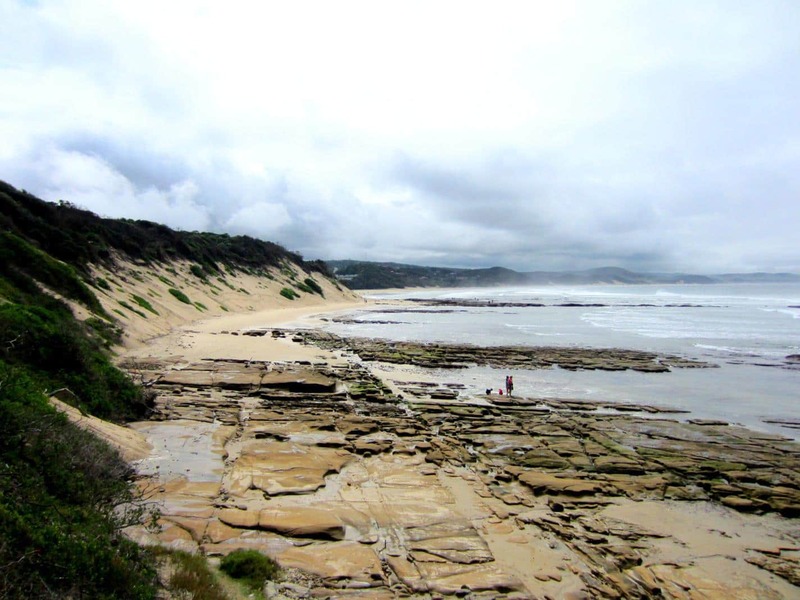 Then a long drive under grey skies took us to Cintsa Bay where we spent the Easter weekend along with some very close at hand and loud neighbours. Upon arrival our priorities were to prepare the braai and enjoy a sundowner, ignoring the increasingly leaden sky above. Poor judgement in not properly establishing camp was rewarded with a chaotic end to the evening as two bodies crawled into the tent soaking wet. The Rendezvous Camp may have been a far cry from the quiet, timeless plains of Africa, but its charm included verdant gardens and stately trees which echoed to the noises of happy children. As if to ease us into the ‘hardships’ of life on the road each site also boasted a private ablution block, with hot water. 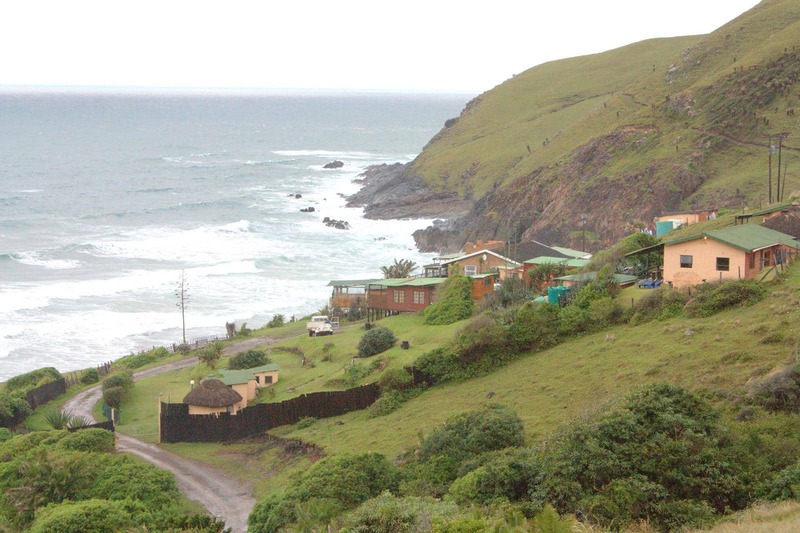 Cintsa has a distinct eastern and western side, with holiday homes clustered on both along the Cintsa River Mouth. 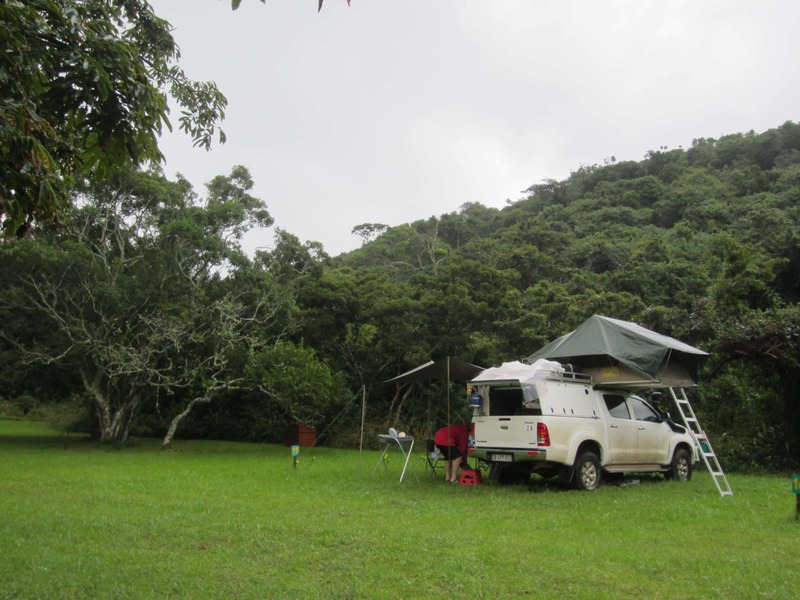 Rendezvous is situated in Cintsa West and a beautiful woody path leads down from the camp to the golden beach. Like the rest of the Eastern Cape we had rain for most of the Easter Weekend but we did manage daily runs on the endless beach. The weather did not seem to keep the keen fisherman from spending peaceful hours on this stretch of coast. 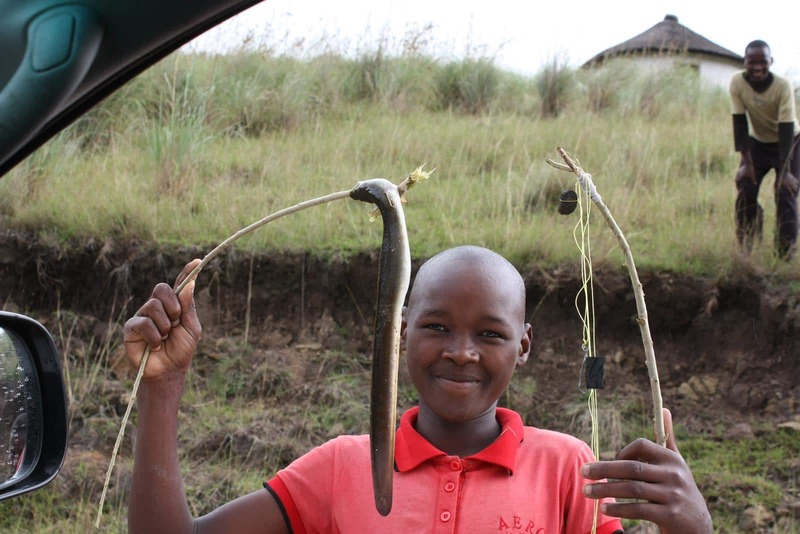 A young boy selling eel along the roadside. On departure our morning pack up was quick and efficient, under dry skies, following the previous peaceful evening after the welcome exodus of the noisy weekenders. 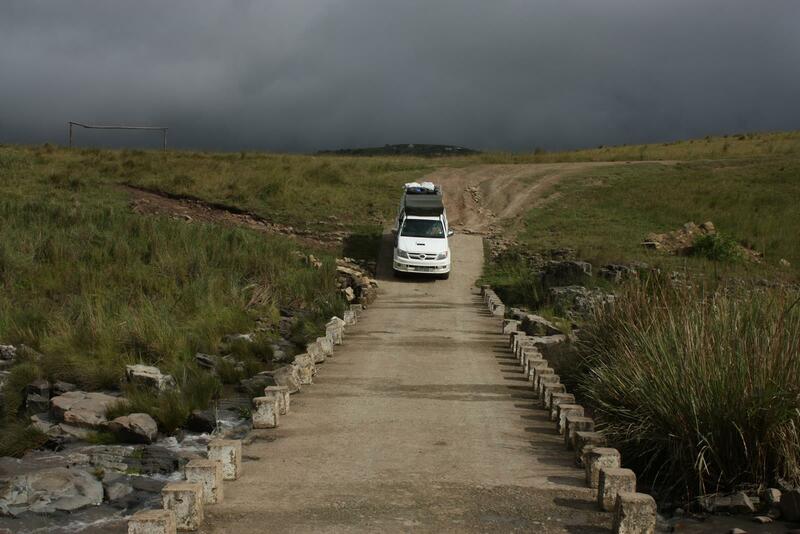 More admin and shopping in East London preceded an easy drive up the N2 until we reached the turnoff to Dwesa in the Transkei. At last our bakkie could begin to prove itself! Indeed it had to after we followed Emily’s instruction on the GPS, advising us to take the first available turn off left to the camp. Our previous gravel road average of 40 kph was cut 8 fold down to walking speed as we eased our way down a rutted track, quickly realising that Emily was premature in her advice. Back on the right road, we descended down to Dwesa in a blanket of thick mist and rain. We were sogging wet in Dwesa. We awoke to rain pounding the rooftop tent awning. What a blessing is such a tent when the ground is totally sodden! Waiting till what we vainly hoped was the last shower to pass we donned our rain gear and reluctantly began the pack up. Just as we finished breaking up camp, the rain stopped! Our destination for the day was the White Clay Resort just south of Coffee Bay. We entered the destination into the GPS and relied on Emily to guide us on what we hoped would be the most direct route. What followed was a superb and truly remarkable day’s driving across the grain of the myriad of rivers carrying their rich brown waters laden with top soil to the Indian Ocean. No sooner had we climbed out of one lush green valley when cresting the ridge, we would drop down to the next. Crossing a low level bridge under dark skies. 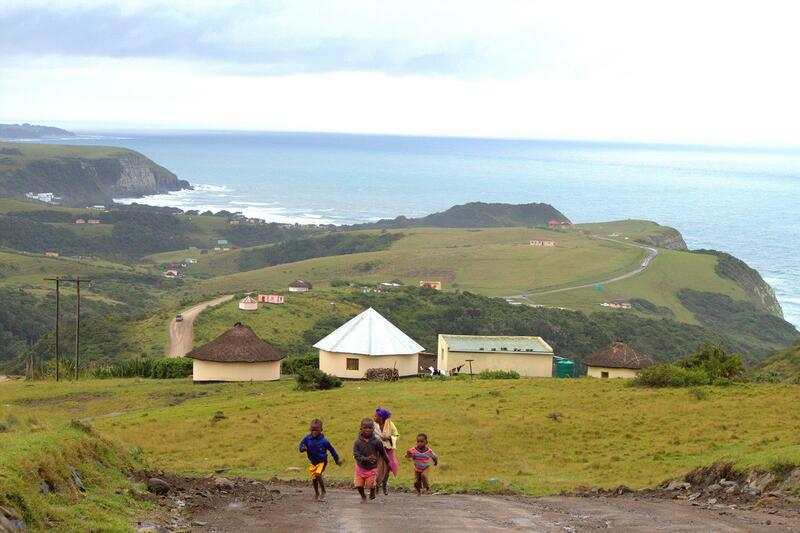 The Transkei is simply beautiful. Rolling green hills are specked with pastel coloured houses, mostly rondavels, and little lappies of mealies. Goats, cattle, donkeys and dogs have right of way and you do not ever travel far without the evidence of the burgeoning population which is slowly affecting the Transkei as well. 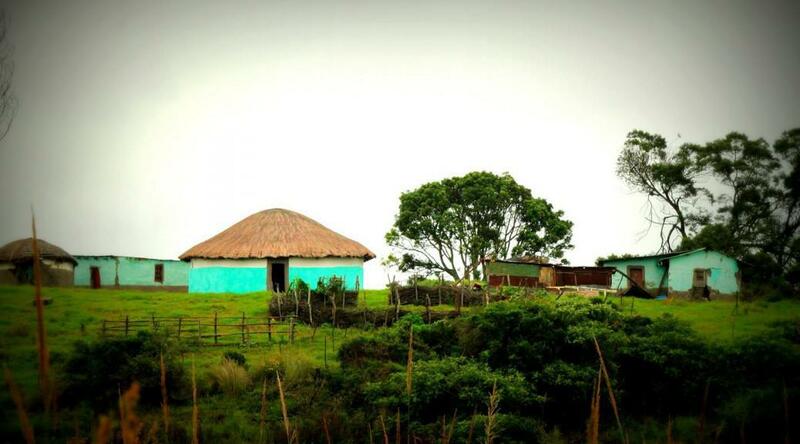 The rolling hills of the Transkei. Seldom did we change up to 3rd gear over the 200 km journey which took around 6 hours. 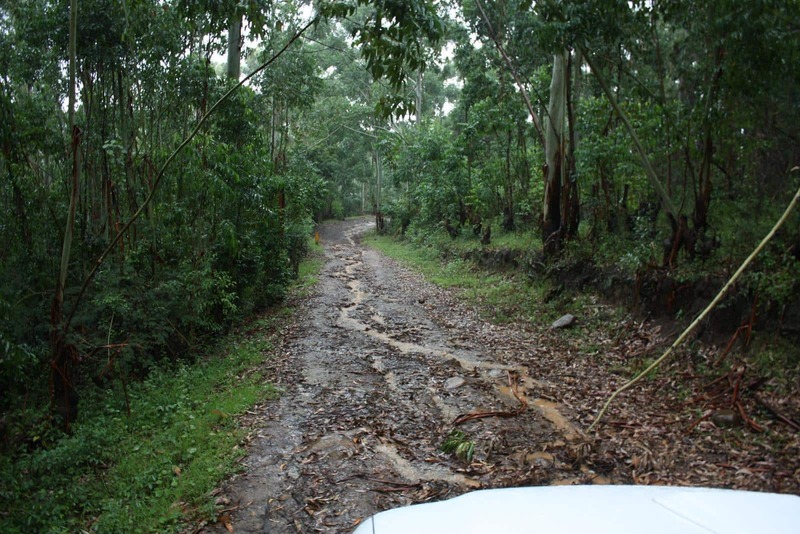 The road varied from very little tar, about as much good gravel, many rutted sections and at one juncture, an extremely muddy, rocky, washed out, and at times steep 4×4 low range cattle track which meandered in the right direction for a few kilometres. The prelude to the shocking low range section of the cattle track where I was holding on for dear life. Apart from a short break for a coffee stop, it rained for most of the day. Reassured by Emily’s dulcet tones we continued in good faith and were rewarded with a stunning view of the bluffs overlooking the ocean just before our picturesque night stop. The White Clay resort is picturesque. Looks and sounds amazing and right on our doorstep (almost)! Hi Oliver, driving through it today, we find the Transkei absolutely awe inspiring! You were lucky to have grown up here!